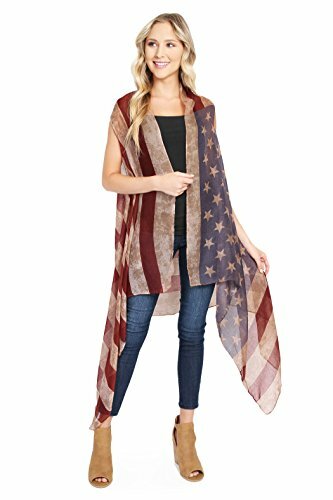 Prim trim and vintage-vibes come together in perfect harmony with this american flag cardi. Features U.S Flag back and angular-cut hem. It'll be hard not to envision yourself dancing under the desert stars in this beauty. ✦RIAH FASHION✦ We offer high quality, stylish fashion accessories & clothing at a very affordable price point. Our talented design team in USA hand picks and curates a variety of chic, trendy women's apparel & accessories. ✦STYLE MADE SIMPLE✦ Discover both classic staples & trendy fashion must-haves from our collection. You can find beautiful women's apparel, jewelry & accessories for a cocktail party, picnic, work, everday casual, and more. Shopping and styling made easy & simple - we will be your go-to shopping destination! ✦GREAT VALUE✦ Enjoy high-end quality, fashionable clothing for women at a low price point. All our products are thoughtfully designed, well-crafted, lovingly packaged, and delivered state-wide. ✦PRODUCT DETAILS✦ Vintage cool and patriotic vibes come together in perfect harmony with this American flag cardi. Create a comfy & chic look on the 4th of July or any day with this light-weight, flowy open front cardigan. Features U.S Flag back and angular-cut hem. MATERIAL: Soft, light-weight, semi-sheer fabric. 100% Acrylic. Imported. SIZE: One Size, Model is 5'9"
If you have any questions about this product by MYS Collection, contact us by completing and submitting the form below. If you are looking for a specif part number, please include it with your message.